The Village at Cedar Hill is pleased to host the next presentation in their popular Speaker Series, “Making it Happen: Successfully Transitioning to Assisted Living”, a panel discussion presented by The Village at Cedar Hill Team: Mary Louise Sayles, Patricia Horn, Melissa Snyder, Sue Spadaro and Denise Vanguilder. 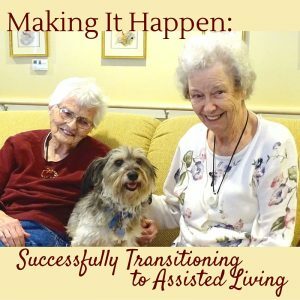 Are you or a family member struggling to make the transition to Assisted Living? The decision to move a senior raises many questions. You or your loved one may ask, “Is help really needed?”; “Will it be easy to make friends?”; or “Can loved ones and friends still stay close to one another?” The answer to these common questions is the same: “Yes!” Whether you’re a new resident or a loved one seeking more information, there are many ways to help make the transition successful, and we’re here to help you. Tips for downsizing – start EARLY! “Senior Move Managers” – are they worth the money? Our panelists include Mary Louise Sayles, who is a senior herself with 60 years experience working with seniors during later life transitions. Mary Louise has an RN with Bachelor’s degree and is a licensed nursing home administrator. She is the Owner and President of Cedar Hill and The Village at Cedar Hill. Patricia Horn is not yet a senior, but works on achieving that distinction every day. She grew up with a nurse and nursing home administrator as a mother and worked as an LNA during high school and college. She then went off into the world of journalism as a magazine writer, editor and newspaper reporter, ending that career at the Philadelphia Inquirer. Alongside her mother, Mary Louise Sayles, she served as a family board member at Cedar Hill for several years until moving here permanently in 2009 and becoming the Nursing Home Administrator in 2011. She now serves as the Chief Executive Officer for Cedar Hill and the Village at Cedar Hill. She, her husband and two children are Windsor residents. Melissa Snyder is a member of what has recently been termed the “sandwich generation”, caught between raising her own family while also caring for her elderly mother. As both the Marketing Consultant for Cedar Hill and a family member of a resident, she has a unique perspective on how to start the difficult conversation, how to balance your options, and how to plan ahead for the transition. Rounding out the panel are Sue Spadaro, Executive Director of The Village at Cedar Hill, and Denise Vanguilder, Director of Financial Services for Cedar Hill and The Village at Cedar Hill. Cedar Hill was founded in 1988 by Mary Louise Sayles, a registered nurse and licensed nursing home administrator with many years of experience in long term care administration. Mary Louise’s daughter Patricia Horn, who is also a licensed nursing home administrator, is Chief Executive Officer for Cedar Hill and the Village at Cedar Hill.